President Ronald Reagan greeting Donald and Ivana Trump at a dinner for King Fahd of Saudi Arabia, 31 years ago. Wait long enough, isolate the rebels, and that's what the war has become, in Aleppo. But as American partners have been going after the Shabab in general more often without any particular focus on individuals linked to Al Qaeda, it has been harder to point to any congressional authorization for such airstrikes that would satisfy the War Powers Resolution. As the election neared, the administration decided it would be irresponsible to hand off Somali counterterrorism operations to Mr. Obama’s successor with that growing tension unresolved. It's a bit odd that of all the things that might have cluttered the desk of the Trump Administration, one thing that rose from that pile was the legal basis for the al-Shabaab strikes. Which suggests a rationale: in the general tradition of restrictive legal interpretations, bringing al-Shabaab under the 9/11 resolution might be seen as expansionary. But since Trump is not obviously concerned with legal principles, is the rationale to ensure that he has to continue the current policy against al-Shabaab, because now they've been linked by a Presidential decision to 9/11? Above, a telegram from Fidel Castro to Pablo Picasso in 1962, congratulating him on winning the USSR's International Lenin Peace Prize. It's one indication of how long Fidel was around, that telegraph was a regular communications medium in his early days of power, while now his death will be marked by Tweets of Commemoration and/or Tweets of Outrage at the earlier Tweets of Commemoration. The content of the [presidential campaign] ads is revealing. Both candidates spent most of their television advertising time attacking the other person’s character. In fact, the losing candidate’s ads did little else. More than three-quarters of the appeals in Mrs. Clinton’s advertisements (and nearly half of Mr. Trump’s) were about traits, characteristics or dispositions. Only 9 percent of Mrs. Clinton’s appeals in her ads were about jobs or the economy. By contrast, 34 percent of Mr. Trump’s appeals focused on the economy, jobs, taxes and trade. Her point: blaming "the media" for not devoting sufficient coverage to "policy" -- the archetypal Vox critique -- is beside the point when the candidates weren't devoting their own resources to it. For let’s be serious here: You can’t explain the votes of places like Clay County [Kentucky] as a response to disagreements about trade policy. The only way to make sense of what happened is to see the vote as an expression of, well, identity politics — some combination of white resentment at what voters see as favoritism toward nonwhites (even though it isn’t) and anger on the part of the less educated at liberal elites whom they imagine look down on them. If you want to feel good about the state of America, you could do a lot worse than what I did this morning: take a run in Riverside Park. Also, as he entered the presidential race, he gave to several nonprofits connected with conservative causes. One of them was Project Veritas, the group run by conservative provocateur James O’Keefe, which has used hidden-camera stings to target liberal groups. Stephen Gordon, of Project Veritas, said that its point of contact had been Corey Lewandowski, Trump’s one-time campaign manager. He said they had a brief meeting with Trump in 2015, at Trump Tower. Trump gave $10,000 from his foundation to the group, which is an IRS-certified nonprofit. “We showed him a couple of videos. He thought that was really cool. And we walked out with a check. It was a typical donor meeting,” Gordon recalled. Note: O'Keefe's level of provocation is appropriately captured by an early stunt from his college days at Rutgers University claiming that Lucky Charms breakfast cereal offends his Irish heritage. As regards ambassadors for either country, may I make a suggestion? An excellent choice for the unofficial ambassador from the United States to Britain—I emphasise the word unofficial—would be Brandon Victor Dixon, the actor who spoke out to the Vice-President-elect about American values and was criticised by the future President. Mr Dixon is the sort of person who is associated with all that is best about the United States. Of course, Mr Brandon Dixon, of whom, I am afraid, I was hitherto unaware is perfectly at liberty to come to this country, assuming that all visa requirements are met, and to spread his message. We look forward to having a new American ambassador in due course to follow in the footsteps, if I may say so, of one of the most distinguished US ambassadors we have seen in this country in recent years, Matthew Barzun. Whether this is true of enough French voters to stop the surging Le Pen from winning the presidency — a victory that would leave Germany's Angela Merkel as the only cosmopolitan in the UN Security Council — is yet to be seen. It's not clear what about Angela Merkel merits the description of "cosmopolitan" and Germany is not a UN Security Council member! Of all 2016’s weird spectacles, nothing beats middle-class envy of the poor for being spared the ordeal of tolerable affluence. With respect to Syria, as I said I think even on this trip in a previous press conference, I am not optimistic about the short-term prospects in Syria. Once Russia and Iran made a decision to back Assad in a brutal air campaign and essentially a pacification of Aleppo, regardless of the potential for civilian casualties, children being killed or wounded, schools or hospitals being destroyed, then it was very hard to see a way in which even a trained and committed moderate opposition could hold its ground for long periods of time. And this (Gulf) visit will be an opportunity for the President to follow up on the progress we’re making on the Camp David agenda, to discuss the Iran deal, and also our efforts to push back against malign Iranian activities in the region, but also, of course, to discuss a full range of regional issues. A key sales pitch for the Iran nuclear deal was that the other bad stuff that Iran was doing was irrelevant to the case for the deal, because there would be other ways to counter that other bad stuff. Now the President is saying on the way out that it's kind of a shame that Iran is assisting Bashar al-Assad to flatten Aleppo. Comey announced he found some emails = 3 above the fold stories. Trump pays fraud settlement = 0. That about right? Some day we'll find those voters in Ohio, Michigan, Wisconsin and North Carolina who based their decision on the New York Times print edition layout of political campaign stories. The alternatives are fraught, perhaps even for the Trump Organization’s bottom line: Thanks to a Clinton Administration precedent, Presidents can face litigation in private matters—so the company will become a supermagnet for lawsuits. That's great passive voice stuff, making it sound like it was something that the "Clinton Administration" did which exposed the President to private lawsuits. In fact, it was the endless litigation originating in the Paul Jones case against Bill Clinton, and championed by the original Vast Right Wing Conspiracy (charter member: WSJ editorial page) which created the precedent. The threads of that case eventually led to Bill Clinton's impeachment! Mr. Bannon’s role in the Trump campaign was never made clear, though fellow adviser Kellyanne Conway called him the campaign’s “general” and a “brilliant tactician.” Mr. Bannon describes a close alliance of himself, Ms. Conway and Trump son-in-law Jared Kushner, who developed a very “tight strategy” that relied on targeted speeches, rallies and social media. They envisioned two possible paths to the White House: one that hinged on Nevada and New Hampshire; the other that “leveraged Ohio” and rolled up Pennsylvania, Michigan, Wisconsin. By the last week they saw the latter plan coming together. There's very little in that obviously connected to editorial decisions at the New York Times, Washington Post, and CNN -- which is where bewildered New Pundits seem to think that the election was lost. With respect to Russia, my principal approach to Russia has been constant since I first came into office. fake news is more viral than real news ... Caulfield found that at least one article from a fake news site was shared far more widely and thus reached a far greater number of people than some concurrently “trending” articles from respected news sources like the Boston Globe and the Washington Post. Ultimately, the fake article garnered thousands more shares than several of the real news stories he looked at. There's a methodological issue around making the general statement fake news being more viral than "real" news based on one example. But there's even a conceptual problem. Fake news attracts attention precisely because of its uniqueness: "real" news will never be viral because by definition, it's being reported by lots of outlets and no one will see any value to sharing it. Fake news can be constructed to a context with the purpose of being surprising and getting attention -- the originality and targeting gives it a platform that real news does not have. Another way to say this is that fake news is trolling -- it's designed to provoke and draw a reaction. That failure to understand how trolling could be a political strategy has put a troll in the White House. ... in order to defend refugees and to stop terrorism, the war in Syria and in the wider region must end. This is the common objective and this requires harmonious cooperation of the U.S., the EU, and Russia. Trump? Er, no. It's Greek President Pavlopoulos during the state dinner toast for visiting President Barack Obama yesterday in Athens! Above, via Sudanese news outlet Radio Tamazuj, an announcement of a rally tomorrow in the South Sudanese capital Juba to celebrate the Trump victory and signal the unity of purpose with President Salva Kiir (wearing his ubiquitous cowboy hat given to him by George W. Bush). Insh'allah, Trump won't be doing to America what Kiir has done to South Sudan. British officials are also keen to play down the idea that Mr Trump had “snubbed” prime minister Theresa May by not calling her earlier, or by speaking to the leaders of Egypt, Ireland and other countries before her. They say the president-elect had intended to speak to her sooner, but confusion about the time difference with London meant the scheduled slot for the conversation was slated for after midnight UK time. Dublin is in the same time zone as London. [White] ethnics believe that they chose one route to moderate success in America, namely, loyalty, hard work, family discipline and gradual self-development. They tend to believe that some blacks, admittedly more deeply injured and penalized in America, want to jump from a largely rural base of skills and habits over the heads of lower-class whites. Instead of forming a coalition of black and white lower classes, black militants seem to prefer coalition with white intellectual elites. Quoted by Roger Hewitt,White Backlash and the Politics of Multiculturalism. Seems like the right tone for the times that are in it. 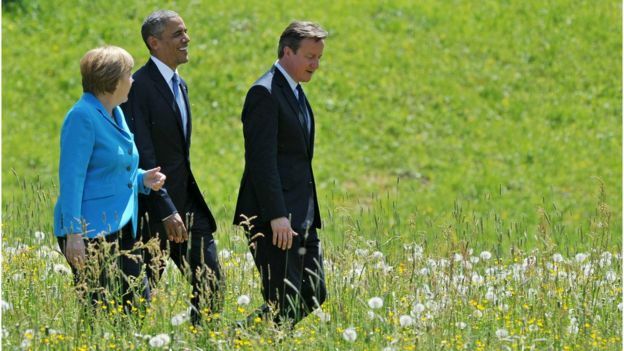 This photo (via BBC), of Angela Merkel, David Cameron, and Barack Obama taking a walk during the G7 summit in Germany, dates from just over 16 months ago. At that time, Cameron had just won a general election, the Republican party was about to experience the ostensible reality TV sideshow candidacy of Donald Trump, and Angela Merkel was in the process of opening the door to what would turn out to be 1 million refugees. Who looked the most politically threatened at the time? There's a huge amount of hindsight certainty (and its counterpart, "if only ...") going around. Nothing is ever so clear in real time. There are many. But one thing is already clear: the New Pundits at Vox can't agree whether a big problem was the mass media, or social media. That's a big difference and in practical terms it has implications for whether CNN or Facebook should be of the focus of liberal anger. Our own view is that social media versus mass media is not necessarily a dichotomy, but it does require a perspective on filters used the consumers of output of these communications. Back in the 1980s, when I was toiling away in the kitchens of Manhattan earning expensive dollars to bring back home to Ireland, the Fed was right in the middle of its war on inflation. The strong dollar was an essential part of this offensive. In the 1980s, when I was toiling away in those Boston kitchens earning expensive dollars to bring back home to Ireland, the Federal Reserve was right in the middle of its war on inflation. The strong dollar was an essential part of this offensive. Piecing together the ingredients of last night's disaster is going to take some time. 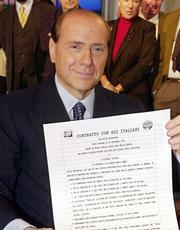 The comparison with Brexit is clear but there's also the comparison with Silvio Berlusconi (seen here holding his Contract with the Italians during the 2001 general election). As with Trump, he was a businessman running a hybrid policy agenda and with an electorate that not put off by his flamboyance and ostensibly outrageous statements. Anyway some other preliminary thoughts. Blaming the pollsters is really scapegoating for a failure of analysis and punditry which ultimately failed to understand how the Trump message was being received -- voters came to conclusions about Trump's words and actions that differed a lot from their content. The focus on dismissing his working class base as not having grounds for "economic anxiety" made an elementary mistake of confusing income level with class -- it's seemingly clear at this stage that there was a big anti-professional/ Bobo/ New Class element to Trump's voter base, which in turn is related to perceptions of who has gained and lost from globalization. These two mutually exonerating responses can still be found today, at least in the system of the mass media. On the one hand, improbability has become an institution. It is expected. It operates as an opportunity for attentiveness. On the other hand, suspicions arise of concealed goings-on, of political machinations in the broadest sense. The mass media are 'manipulating' public opinion. They are pursuing an interest that is not being communicated. They are producing 'bias'. It may be that everything they write or broadcast is relevant, but that does not answer the question: what for? Their concern may be to achieve commercial success, or to promote ideological options, to support political tendencies, to maintain the social status quo (this in particular by providing a drug-like distraction towards ever new items of news) or simply to be a commercial success. The mass media seem simultaneously to nurture and to undermine their own credibility. They 'deconstruct' themselves, since they reproduce the constant contradiction of their constative and their performative textual components with their own operations. Pointing to the precise moment this devaluation occurred is difficult; it was a gradual process. But the embodiment of what I’m talking about is someone like Sarah Palin, who started out as a relatively conventional, if unaccomplished, Republican governor and was thrust into the spotlight as John McCain’s vice-presidential nominee in 2008. Since then she has become the proud personification of thoughtlessness. I don’t agree with President Obama on very much, but he was right when he said there was a straight line that could be drawn from Ms. Palin to Mr. Trump. A party that produces Ms. Palin as its vice-presidential nominee and Mr. Trump as its nominee is at war with reason. Today, Senator McCain made an exciting decision in choosing Alaska Governor Sarah Palin to join him on his ticket as the Vice Presidential candidate. Governor Palin is a proven reformer who is a wise steward of taxpayer dollars and champion for accountability in government. Governor Palin's success is due to her dedication to principle and her roll-up-your-sleeves work ethic and serves as a wonderful example of the spirit of America. By selecting a working mother with a track record of getting things done, Senator McCain has once again demonstrated his commitment to reforming Washington. I applaud Senator McCain for selecting Governor Palin. This decision is yet another example of why the American people can trust him to make wise decisions and to confidently lead this country. Peter Wehner worked for President George W. Bush. See this May 2006 explanation from Dan Froomkin of the critical role that he played -- especially interesting when read from Trump hindsight. 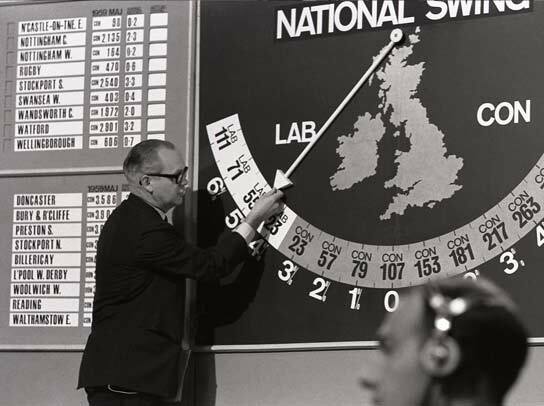 The BBC's Robert McKenzie with the Swingometer on Election Night in 1964. Assumptions about national and regional swings in polling play a key role in explaining why the 538 probability favours Trump more than other poll-based prediction models (Vox). One odd thing about the 538 model is that it's unusually sensitive to news that registers in post-news polling compared to other models. Thus, the attention that it gets as an apparent alternative to punditry and ground-reporting based assessments of the campaign is somewhat misplaced. “We were sure of the (negative) impacts of deploying U.S forces in the area as it is seen today in Iraq, Syria and Libya,” said al-Bashir, adding that Sudan has previously warned of a "Zionist and Shiite project to divide the region". Today, people think Obama — a man who should represent the fulfilment of the American dream — is an elitist. They don’t understand what he’s saying. It’s a failure of our educational system, it is the result of reality television, it is the result of capitalism. It’s the downward spiral of American culture. To spend so much time on such a trivial matter would be absurd in a city council race, much less a presidential election. To do so in circumstances when it advances the electoral prospects of a rival who has shattered all precedents in terms of lacking transparency or basic honesty is infinitely more scandalous than anything related to the server itself. The nature of two-party democracy is that elections are decided by the small minority of the public too confused or too ill-informed to realize that there are persistent, substantial differences between the two federal political parties. As a result, the issues (or, more likely, pseudo-issues) that are most important in deciding elections tend to be the issues that are least important in substantive terms. It's a similar story, but there's a question: is Trump really a new phenomenon or predictable from the conduct of previous presidential campaigns and the role of the mass media therein? Follow up question: is it the same small minority distracted by earlier imbroglios like earth tones which is now being distracted from the awfulness of Trump? Two US military trainers were killed on Friday morning after their vehicle tried to enter the Prince Faisal Airbase in Al Jafr area, south of Jordan, an official source at the Jordan Armed Forces said. The two trainers were killed in a fire exchange at the gate, the source added. A Jordanian officer and a third US trainer were also injured in the incident. The Middle East keeps finding ways to get more complicated. Russia on Thursday criticized U.N. chief Ban Ki-moon's decision to fire a Kenyan peacekeeping commander in South Sudan as premature, saying the mission there was now "in ruins" after Kenya vowed to withdraw all its troops in response to the move. Ban dismissed Lieutenant General Johnson Mogoa Kimani Ondieki after a U.N. inquiry into the response by peacekeepers to several days of violence in the capital Juba in July found a lack of leadership and that U.N. troops failed to protect civilians... In an unusual move, Russia, a U.N. Security Council veto power, and Kenya publicly criticized Ban's response to the report. "For us the decision was premature," Russia's Deputy U.N. Ambassador Petr Illichev said. "We don't have a special representative, she's leaving, we don't have a force commander. ... The whole structure is in ruins." Africa is one of the generally ignored areas of US foreign policy failure in the last 8 years, and South Sudan is on the top of that list.